Preschool kid raise arm up to answer teacher question on whiteboard in classroom,Kindergarten education concept. 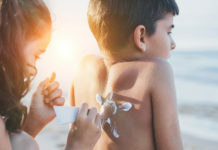 New research by Western Sydney University explores the concerning impact our changing climate and increasing heat is having on Australian schools and childcare centres, as experts predict temperatures will reach extreme heights this summer. The research found dangerously high surface temperatures in outdoor play spaces, raising important questions about children’s safety and learning outcomes. Following experiments within a number of childcare centres, the data reveals that the worst temperatures were measured on the surface materials initially considered the safest for outdoor play, including AstroTurf and softfall. Senior researcher and initiator of the Cool Schools report, Dr Sebastian Pfautsch, commented: “We saw temperatures rise up to 98 degrees Celsius on AstroTurf, raising concerning questions about the impact this is having on children’s wellbeing, as we know children are far more vulnerable to heat stress than adults. Professor Kathryn Holmes, also part of the Cool Schools research team, raised questions on the impact rising heat in play areas could have on children’s physical activity levels, as school students are expected to spend a lot more time indoors in the future to avoid the rapidly increasing temperatures. She said teachers in NSW already deploy a range of traditional cooling strategies, such as encouraging appropriate clothing for the heat, ensuring blinds are closed and handing out water bottles on hot days. More schools have also had started installing covered outdoor learning areas (COLAs), to provide more shade. The report also noted concerns that trees are disappearing from schools at an alarming rate. Dr Pfautsch questions how outdoor education can safely be delivered if temperatures are increasing, yet schoolyards are becoming distinctively empty and offer minimal shade. “Trees provide significant environmental, economic, social, psychological and physiological benefits to students. As well as offering shade, trees create fresher air and provide fantastic habitat and food sources for insects and animals, resulting in beneficial learning and recreational environments for children. It’s very concerning to see even more trees rapidly disappearing from our schools,” said Dr Pfautsch. The Cool Schools report forms part of Western Sydney University’s investment in sustainability-related research, with around 70 researchers and 400 projects already underway dedicated to a climate change-impacted future. Western Sydney University also launched a new awareness campaign, Earth IQ, aimed at engaging and empowering millennials and their communities through social media. 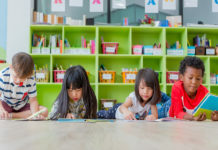 The Western Sydney University Cool Schools Initiative (CSI) was launched in 2018 to develop interdisciplinary research programs for heat-resilient primary and secondary school environments and design of heat-resilient curriculum. This report summarises current research in health and environmental sciences, planning policy, legislation and standards, sustainability education, and innovative design trends. Its purpose is to inform future research into student thermal comfort and cooling solutions for schools in Western Sydney and NSW.